Jewish history has more than its share of sad events, and not every Jewish occasion is a happy one. 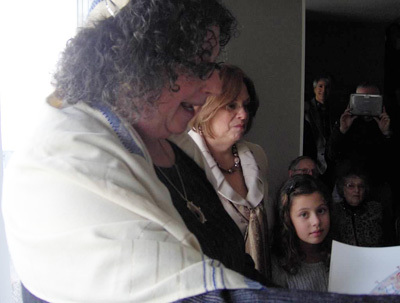 But part of Judaism’s ability to survive since ancient times is its capacity for joy and celebration. Ellen’s warm, friendly presence and beautiful voice amplify the joyousness of happy occasions and bring comfort to the ailing and to the mourner. Thanks for the amazing ceremony you performed for our renewal of vows. You were more like our special guest and family member at our party, and we wouldn't have changed a thing! Personal Jewish status (that is, whether a person is “officially” Jewish by Jewish law) isn’t as important to Ellen as a person’s identity as a Jew. 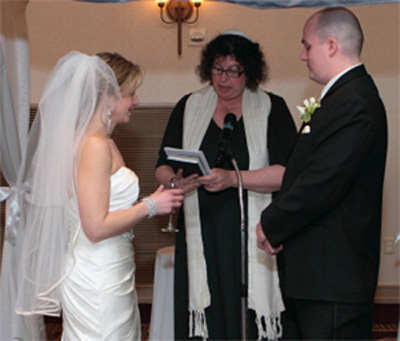 She’s happy to officiate at weddings in which one partner is not Jewish if the couple is committed to making a Jewish home and, if relevant, rearing children as Jews, and she recognizes as Jews children of a Jewish father and non-Jewish mother who were brought up Jewish or are being reared to identify as Jewish by religion.